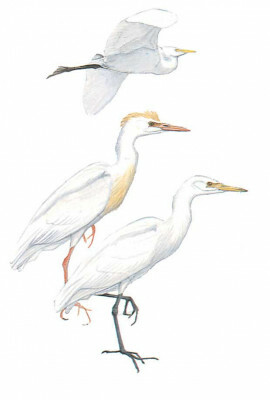 A small, white meadow-dwelling heron, usually seen in flocks, and frequently associates with cattle. It differs from Little Egret by stockier build, shorter pale bill, neck and legs, extended "jowl" under bill and faster flight. Also in breeding season orange-buff wash on crown, back and breast, and reddish bill. Usually seen feeding in flocks or flying in groups to and from roost sites.